Depending on a very ancient recipe, this liqueur is obtained by the infusion of officinal herbs and rose petals in absolute alcohol. It is a liqueur of high alcoholic strength, 50° or 70°, with warm and strong character just like the fire from the volcano. Still it joins a very pleasant, fine aroma to powerful taste. Its colour is intensive red. Excellent as digestive drink and fortifying on cold winter days. 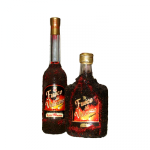 The liqueur is bottled also in bottles covered with volcanic stone.